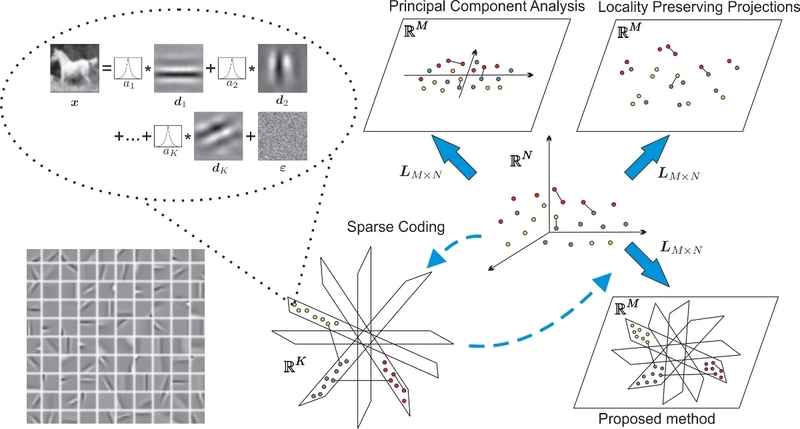 Abstract: We propose an approach for linear unsupervised dimensionality reduction, based on the sparse linear model that has been used to probabilistically interpret sparse coding. We formulate an optimization problem for learning a linear projection from the original signal domain to a lower-dimensional one in a way that approximately preserves, in expectation, pairwise inner products in the sparse domain. We derive solutions to the problem, present nonlinear extensions, and discuss relations to compressed sensing. Our experiments using facial images, texture patches, and images of object categories suggest that the approach can improve our ability to recover meaningful structure in many classes of signals. All results in this paper were produced using the libslm library.